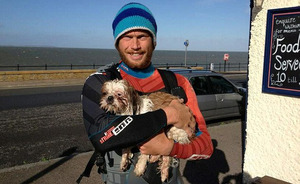 A paddleboarder from the Isle of Wight is being called a hero for rescuing a Shih Tzu who’d become trapped in the most unlikely of places. It started out as a typical day on the water for Charlie Head, a water sports enthusiast who left Cornwall on his paddleboard in July and has been making his way to London ever since. Head embarked on the trip as a way to train for an even larger one: a 3,000-mile journey across the Atlantic in a one-man rowboat. Head had no clue how the little pooch managed to get out there, but he knew that if he didn’t act fast, the Shih Tzu would certainly drown. “He just sat there wondering what the hell to do. He was absolutely terrified,” Head said, describing the Shih Tzu as the pup scrambled to cling to the rocks and the ocean swelled around him. “In about ten minutes the rock would have been covered with water,” explained Head. The adventurer quickly steered his board in the direction of the struggling Shih Tzu and paddled as fast as he could. When Head reached the rocks, he saw that the pup was terrified. The paddleboarder talked to the stranded Shih Tzu gently, offering words of comfort as Head scooped the little dog up and placed him onto his board. “And when he felt safe he snuggled up between my legs and we headed back to shore,” Head said. A camera mounted to the paddleboarder’s helmet captured the whole rescue on video. Back on dry land, Head and the shivering Shih Tzu walked to the Hampton Inn Pub, the nearest building in sight. Chelsea Clark, a barmaid at the pub, wrapped the soaked pup up in a towel. Clark couldn’t believe the predicament the dog had been in before Head came along. When the group took the little dog to the local animal control, the warden there discovered that the Shih Tzu, Bam Bam, had a microchip. “We were calling him Pebbles until the dog warden looked at his microchip and found out his real name,” said Clark, who plans to adopt Bam-Bam if the dog’s owner is not found.